Monster Hunter 4 finally has a firm release date for Japan, which now prompts franchise fans in the West to start counting the days to a localisation reveal. Japan is truly the series' homeland, however, with handheld entries in particular being a major boon to Nintendo; Monster Hunter 3 G played a notable role in the 3DS revival of late 2011. Ahead of its release on 14th September, Capcom's engaging its hype machine to build up to the big day. A recent event gave producer Ryozo Tsujimoto and director Kaname Fujioka an opportunity to talk about some new features in the latest entry, covering weapons, touch screen functionality and online play. In terms of online play, this is set to be called "Play With Everyone", and rather like Monster Hunter 3 Ultimate on Wii U will allow the host to select targets, descriptions and passwords for the room, while Recruit Hunter may be the equivalent of checking on those on your friend list or guild card equivalent. We'd hope that a reveal to come later in the year — of which Capcom is promising plenty — will be voice chat using the built-in 3DS microphone; we like to dream. It was revealed that the touch screen will show villages that can be visited — as the player's hub is now a movable caravan — while a village called Barubare was shown. The Charge Axe, new for this game, was also shown off — attacks in the sword mode charge up energy, and when the weapon glows it's a good time to switch to the axe and unleash powerful attacks with that accumulated energy. At the end of the event, Kaname Fujioka said the following in a short interview, promising more information ahead of the game's arrival. There’s still plenty more content compared to past Monster Hunter titles. Not only the number of monsters, but it’s also packed with new communication features and more, that will allow you to enjoy even the game longer. There’s much more new content we’ve yet to reveal that we’ll be showing off by the bulk, so please look forward to it. We look forward to hearing all about it, and a Western release date, of course. Do you like what you've heard so far about this new entry in the series? If you missed it last week, the latest extended trailer is below for your viewing pleasure. It would be so Awesome if they would release it worldwide on September 14 , looks epic ..
@Shiryu me too shiryu....me tooo! ...so, the new weapon is just a reversed switch axe? If this was to be localized next year, I best start saving up money for it now. Yes this is needed. At about 310 hours or so into the Wii U version of MH3U. As soon as I can read it I'll buy it. There you go, everyone. We will now be able to hunt online with our 3DS'. 150+ hours in 3U. Moga 6* currently. "...enjoy the game even longer." Wow, just when u thought 300+ hours was a long time. @Shiryu Well, 3G wasn't originally gonna have a Wii U version, but Capcom decided to do it later, so I'd bet it'll get one. this a day one for me if we get it.i can't stop playing ultimate! Looks like the same game. Won't buy it, they are just making quick money grab re-makes instead of actual sequels with big improvements. While I get your point and agree I don't think Monster Hunter 4 is your typical money grabber. I think its comparable to a racing game, sure the new game will have more cars, more tuning, more racetracks but at the end of the day you do just that: drive a car around a racetrack. Same with MonsterHunter, the ultimate underlying formula HAS to be the same or it won't be MonsterHunter anymore. That said Monster Hunter 3 U is the only game that Im playing 150+ plus already since... since... Halo 1. MHU3 ultimate was just an update and it has double the monsters of tri with much different experiences. Of all the things Capcom does this is one that actually isn't a money grap. Can't wait for this to be released in the west. And I really hope they keep Brachydios in MH4. I mean c'mon, they kept Lagombi. God I hope this has good online play. I really wanted to play 3 Ultimate because of how great it looked but I couldn't bring myself to buy it knowing it was wifi only. I have no friends who have 3DS so yeah.. no multiplayer. Now, if this has good multiplayer online, I'm in. @Shiryu you took the words outta my mouth! I would definitely buy this one, although I am more concerned about the localization status of Fantasy Life and Professor Layton vs Ace Attorney. 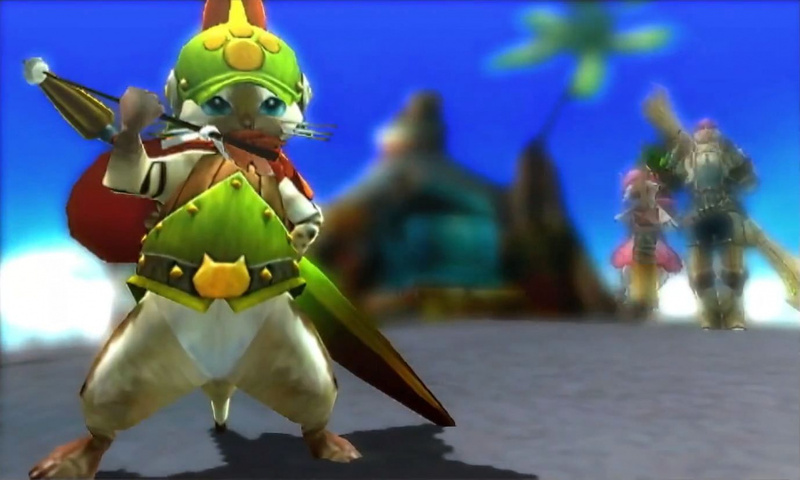 I loved playing Monster Hunter 3 Ultimate through hunter search with friends. I am eager to get the opportunity to try the next iteration of this series. It keeps looking even more epic each time new information is released. I hope for the wiiu version. Instant buy then got over 200 hours within the first three weeks on ultimate. I'm really hoping for a Wii U release at the same time the localization on 3DS arrives.... I mean as cool as it is to have MH on the go, I just can't sit and play on a 3DS for 8 hours straight... The Wii U is perfect for long playing periods, while the 3DS is fine for short bursts. Plus the web browser is always handy to bring up carve percents, etc and then right back into the game. @GamerJunkie Yet it takes place in a new region, with new weapons, new monsters, the ability to jump (and attack mid-jump), and a movable hub with more than one village to visit... Yeah... Totally a money-grab copy-and-paste... This game is going to be epic. @Dpullam you can play the 3DS version online??? How do I do it? I feel like they went all-out on this one. There are so many monsters..
@WhoBeThat I must apologize to you and DanielHPoetry. I meant that I loved playing it through the wireless connection via hunter search with my friends. As far as I know, there is no way to play it online with your Nintendo 3DS. I'll edit my comment to avoid more confusion. I really hope it comes to North America! It......looks......EPIC!!!!!!!!! @defrb wow and i thought that the 70 hours of MH3U that i have played is kind of a lot.